Most reports give you the option to select how to sort the report and also filter which players you wish to appear on the report. Each report has an option screen that appears before the report is displayed on the screen. A summary of how it will be sorted is displayed. If you wish to change how the report will be sorted, click the Select How to Sort Report button and select the items to sort by. Reports can be sorted by up to three items deep. Items can be sorted ascending or descending. TM automatically saves how the report was last sorted...so this will be how it is sorted the next time it is displayed. 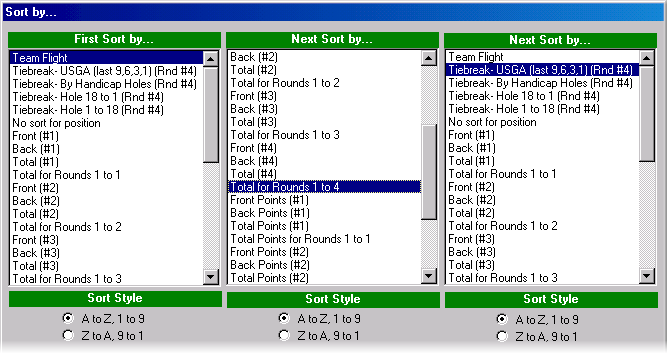 Example: Assume you want a report to show team flight winners for a four round tournament with any ties broken by the USGA Tiebreak on the last round's score. 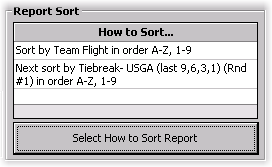 You would set your report to sort first by flight (Sort A to Z), then total for round 1 to 4 (Sort 1 to 9), and finally USGA Tiebreak (Sort 1 to 9). Most "individual player" reports have an option screen that appears before the report is displayed on the screen. A summary of how it will be filtered is displayed. Include Flight(s)-- Select “All flights” to show all flights on the report. If you only want specific flights on the report, type the flights to display in the box. For example, to display only the A and B flights, type AB in the flight box. 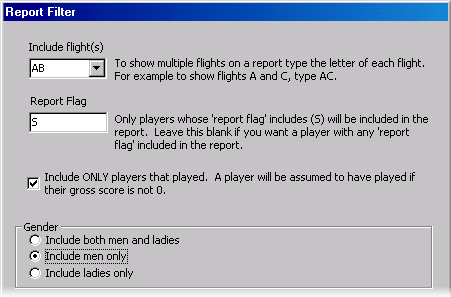 Report Flags-- Type in appropriate flag to only include players with that particular flag. Include only players that played in the current round-- If you check this box, only golfers that played in the round (the round you are viewing) will be displayed on the report. Gender-- You can select to include only men, ladies, or both. Note: TM automatically saves how the report was last filtered...so this will be how it is filtered the next time it is displayed.